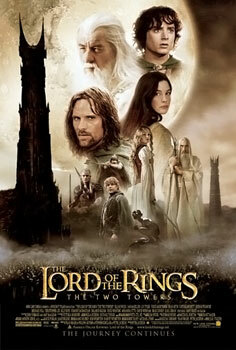 I’m sure the first installment of the trilogy, The Fellowship of the Ring, earned the film fans. It’s really a technically superior film, so the members of the Academy in the technical branches may have also backed the film with # 1 votes. But considering the fact that it still has the last installment next year to reward the whole franchise as a whole, and that seems to be the perfect time to honor these films, I don’t think a lot of people thought that the film urgently needs the award. With that, I guess it was the fifth in the voting. The film continues what Fellowship of the Ring has left. Now, it already tells three intertwining stories. It basically details the journey of the members of the Fellowship as they find their way to Mordor to destroy the One Ring. I don’t want to write much about the poem since the film is so eventful, yet I don’t want to fill this review with only the summary. Anyway, the thing is, you should watch the film. The direction is as good as you can get. It cohesively puts these events together with complete ease, and yet, it does make it feel that we are in for something distinctly epic. Each scene feels complete and carefully guided, and this is really something great for a film with this massive scope. Also, I also appreciate the change of atmosphere in this film in comparison to the previous installment. This movie is noticeably much darker than the first LOTR film, but it does not even become bothersome because it picks up what the last film had left and plays with it to make the graceful continuation of the story. The screenplay strongly puts these stories together and weaves them together in a very natural fashion that you just get carried away by the flow of the story. Each character registers a certain amount of importance that the material reaches its maximum potential of achieving a grandiose tale and at the same time a sturdily-constructed character study for these characters. The cinematography is very effective in showing the difference of the mood of this film compared to the last one, but the thing that has not changed is on how it captured the fantasy the film hinges on. At the same time, the visual effects aid the storytelling process into a total maximum. The whole view of the film makes the film more of a visceral experience because it all looks complete. What we see here is a 360-degree world, and that is a plus for a film like this. The production also adds up to the film’s effectivity in its visual aspect. The editing also deserves equal praise for putting the entire the film into a compelling feeling of being in clockwork – there is always something next, and it is always a thrill to watch what’s actually next. The music effectively gets the aura of the film. Some scenes are just totally chilling to see, and most of the time, it is because of the music’s impact to them. The sound design is great in feeding our aural senses with completeness of the work, making the craftsmanship that went in the production more evident. The actors do justice in their characters, though none of them are actual stand-outs. But just like what most people have noticed, Andy Serkis provides a blast in his computer-generated performance as Gollum. He provides remarkable mystery in his character, and his scene where his two personalities seem to fight with each other, and we see it, and you know what you are watching is really acting greatness. As a fantasy epic, the film does not fail. This is great cinema. I still prefer the first installment, but the film is as good as it can get.This film is fully satisfying and overwhelming. The craftsmanship is very visible. The final fight scene is probably one of the best scenes ever filmed. This entry was posted in Best Picture 2002, Best Picture Project and tagged The Lord of the Rings: The Two Towers by Juan Carlos Ojano. Bookmark the permalink.